RTW – Eyes on Your Audio: RTW - ... a RTA? The RTA (Real Time Analyzer), which is available for several systems from RTW’s TouchMonitor series, shows the spectral distribution of the frequency range and the relationship between the frequency bands considering how the human ear senses the audio signals. As a matter of fact, the human ear perceives different frequencies with the same acoustic pressure not as identically loud. 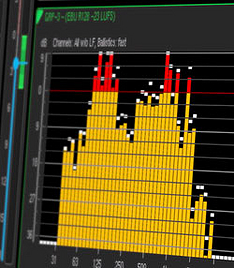 For this reason you can select different standardized weighting filters in the configuration of the RTW TouchMonitors and these filters are used for the audio analysis. The most common one is probably the A-weighting. In this way, the system provides a quite realistic picture how the currently metered Audio sounds. The RTA has a horizontal axis that shows the frequency range. The standard frequency range would be from 20Hz to 20 kHz. This is the typical range that a human ear can detect. However, if you are only interested in the Low Frequency range, you can configure that the axis starts with 5 Hz and ends at 5 kHz, which provides a higher resolution for this frequency span as well. Almost all parts of the human speech are covered with that range, for example. For special applications, you can extend the 20 kHz frequency range with the H band that even shows summed audio content higher than 20 kHz. The resolution of the RTA can be set to 1/3 octave, 1/6 octave or with the latest firmware release for TM7 and TM9 even to 1/12 octave. The vertical axis shows the resolution in dB. You can select 3, 6 or 9 dB as resolution. In this way you can define the range of the displayed audio signals. To add a reference point to the display, a value between -18dB and +21dB can be set in the configuration menu. Depending on the shape of the distribution curve appearing through the amplitudes of the bargraphs, you can evaluate a bassy or trebly sound material or missing frequency parts. A spectrum analyzer is essential for dance or techno music or similar productions containing extremly low-frequency signal components.